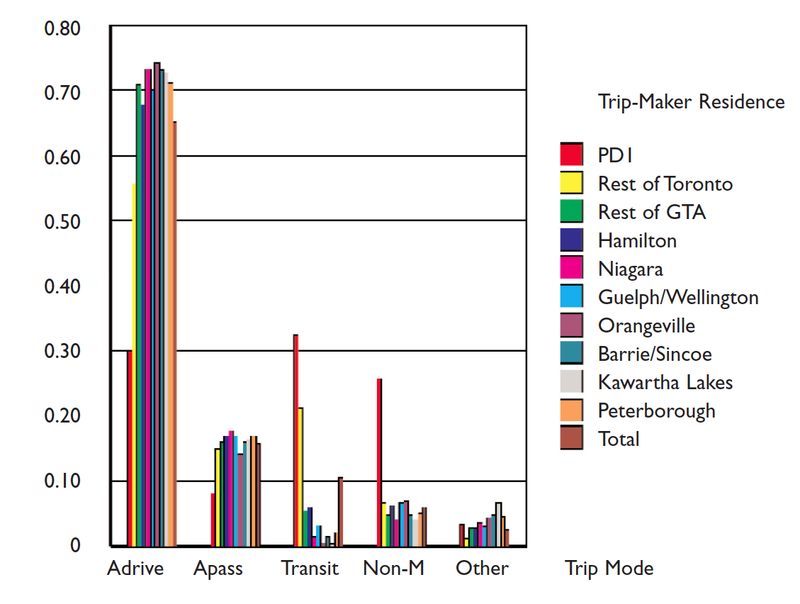 As shown in Figure 3.2, outside the City of Toronto, total daily person trip rates vary over a relatively narrow band of a low of 2.07 (in Kawartha Lakes) to a high of 2.45 (in Peterborough) trips per day.12 The COZ-wide average daily trip rate is 2.17 trips/person. The much lower daily trip rates reported for City of Toronto residents (and, in particular, Planning District 1 residents) almost certainly reflects missing walk trips for non-work/school trips (which are not collected in TTS), since home-based-work and home-based-school trips rates for Toronto are comparable to those for other areas, and there is no reason to believe that Toronto residents are inherently less mobile than other Central Ontario Zone residents. 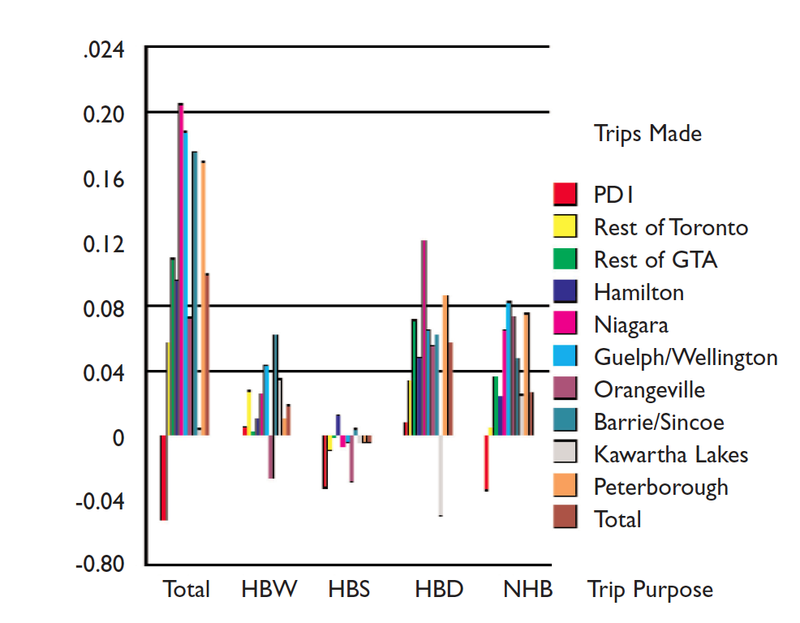 If this hypothesis is correct, then if one were to account for these missing walk trips, the non-Toronto COZ average daily rate of 2.27 trips would probably be more representative of overall COZ daily trip-making. Figure 3.3 shows the changes in daily person trip rates by trip purpose between 1996 and 2001. 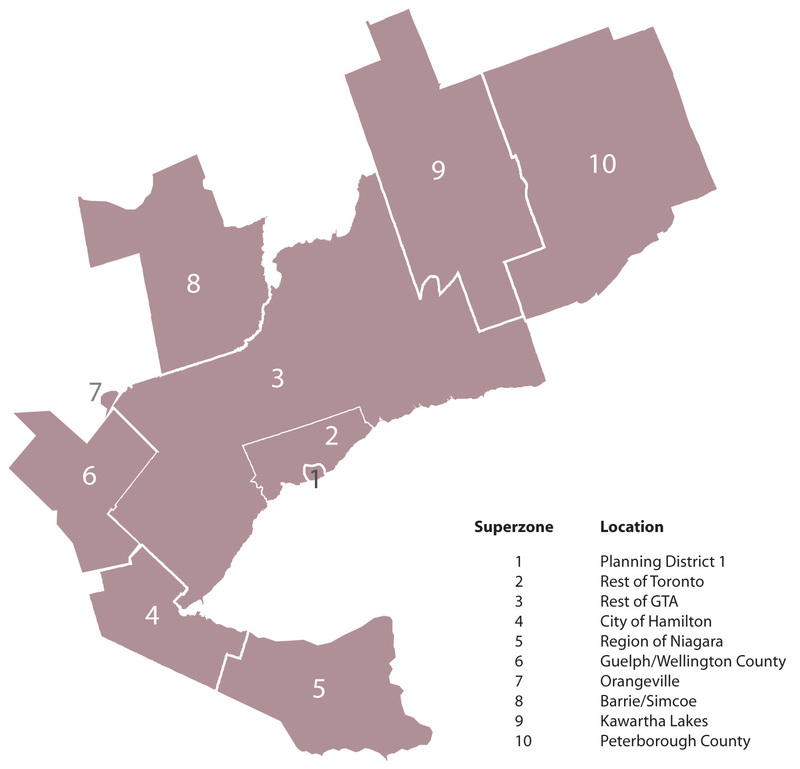 With the exception of residents of Planning District 1, per-person trip rates have increased over the past five years across the Central Ontario Zone by 0.10 trips/day. This represents a continuation of a longer-term trend for the GTA+H, where rates increased by 0.05 trips/day between 1986 and 1996 and by 0.55 trips/day between 1964 and 1996 (Figure II.1, Appendix II). As in the earlier time periods, this growth in trip-making is largely due to an increase in trips that do not represent commuting to or from work or school and that often occur outside the traditional morning and afternoon peak periods. increased personal activity levels due to increased work-related activities, increased leisure activities, or both. 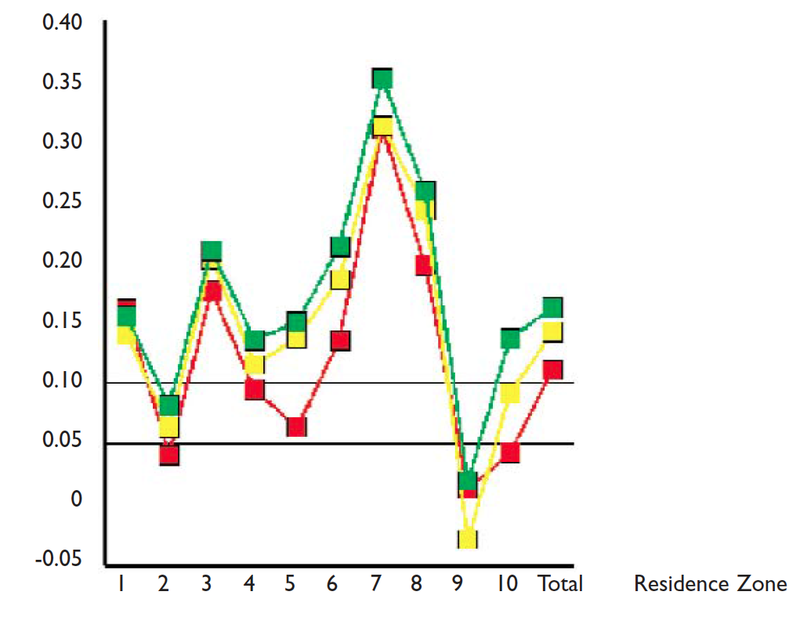 Figure 3.4 shows the distribution of COZ household auto ownership levels (no car, one car, two or more cars) by household zone of residence. Only 14% of Central Ontario Zone households do not have access to a vehicle for personal use, while 46% have two or more cars. 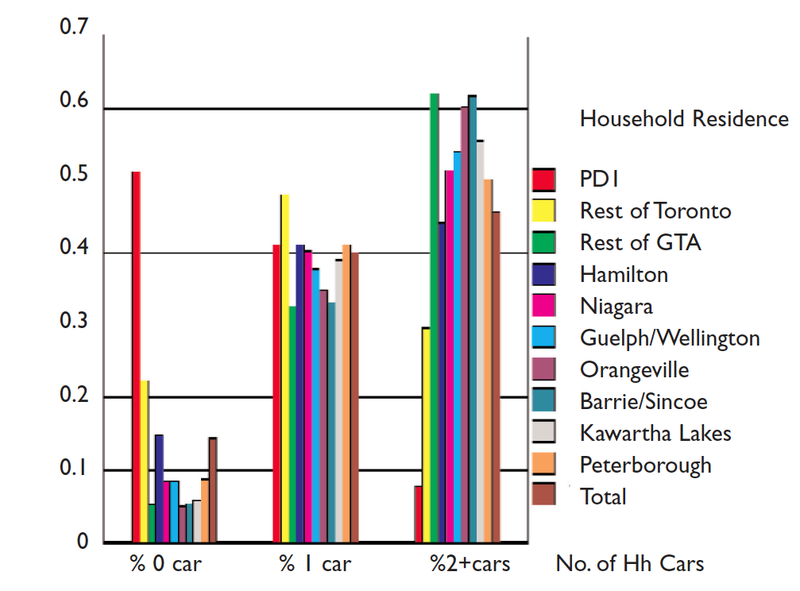 Of the households that do not have a car, 70% live within the City of Toronto. The growth in daily person trip rates discussed above translates into changes in average daily trips by mode as shown in Figure 3.6. As is evident from this figure, the growth in trips per person between 1996 and 2001 has occurred almost entirely through increased auto-drive trips per day. Trip rates for all other modes of travel exhibit only very small growth in a handful of cases (most notably, both auto-passenger and transit trips per person have increased slightly for GTA residents outside the City of Toronto), and more generally show no growth or else a small decline. As shown in Figure 3.7, this results in an across-the-board increase in auto-drive mode shares (+1.5% overall for the COZ), with a corresponding universal decrease in mode shares for all other modes of travel (COZ-wide: -0.4% for auto-passenger, -0.8% for transit, -0.3% for non-motorized modes), with the single exception of extremely small increases in mode shares for transit and non-motorized modes for Planning District 1 residents. Again this trend is consistent with longer-term trends within the GTA+H (see Figure II.3, Appendix II). reductions in transit service levels due to budget cuts. In recent years, because of a lack of operating support from senior levels of government, transit agencies in the Central Ontario Zone have been forced to cut service in many instances. As a result, the TTC and GO Transit are undoubtedly the most efficient transit agencies in North America in terms of operating cost-recovery ratios,15 but this achievement has come at the expense at some loss in ridership, especially in the case of the TTC. Equally important has been the inability over the past two decades to expand the transit system to keep pace with development. This is, for example, generally the case with GO Transit, which has historically been "supply constrained" - that is, the GO system could carry more riders if it had the capacity (including parking capacity at suburban stations) to do so. A similar case can certainly be made for the TTC. In an examination of long-term GTA trends in work trip mode choice between 1964 and 1986, Badoe (1994) hypothesized that the significant increases in transit infrastructure that occurred during the 1960s and 1970s, including subway expansions and the introduction of GO Transit services, were able to keep transit work trip mode shares relatively constant over this period, despite significant suburbanization and growth in auto ownership. Figure 3.8 shows the net effect of all these changes on 2001 COZ modal shares. Auto-drive is clearly the dominant mode of travel: 56-74% of all trips taken by residents outside Planning District 1 are made this way. 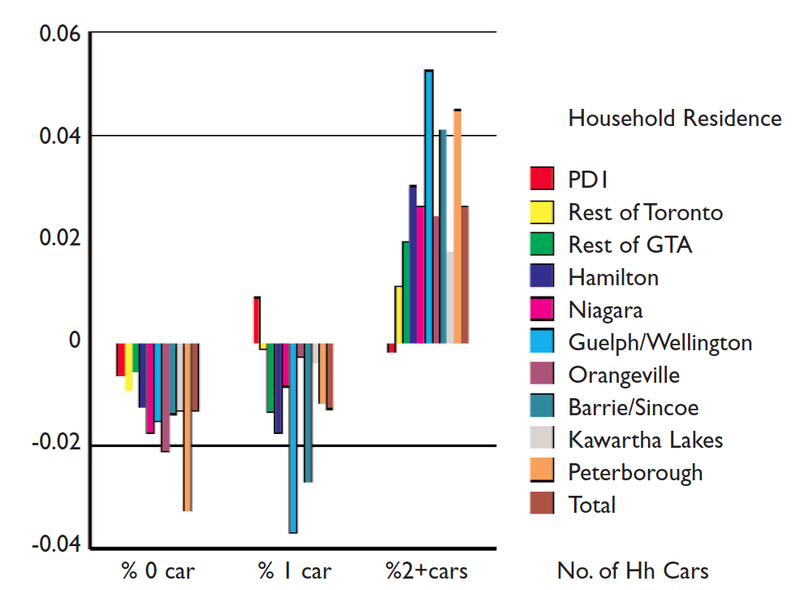 Auto-passenger is also significant: 14-18% of trips by non-PD1 residents are made as a passenger in a car, and auto-passenger trips exceed the number of trips by transit and non-motorized means combined everywhere except the City of Toronto. Across the region, the automobile mode (drivers plus passengers) accounts for 81% of all weekday trips. Clearly, when an urban region grows in population and employment, as the Central Ontario Zone has, increased levels of travel will occur. This increase has been exacerbated, however, by increasing numbers of daily trips per person, increasing household auto ownership levels, and the increasing mode share for auto-drive. As a result, automobile trips in the Central Ontario Zone (and the associated congestion and pollution caused by these trips) have increased more than the growth of the population. 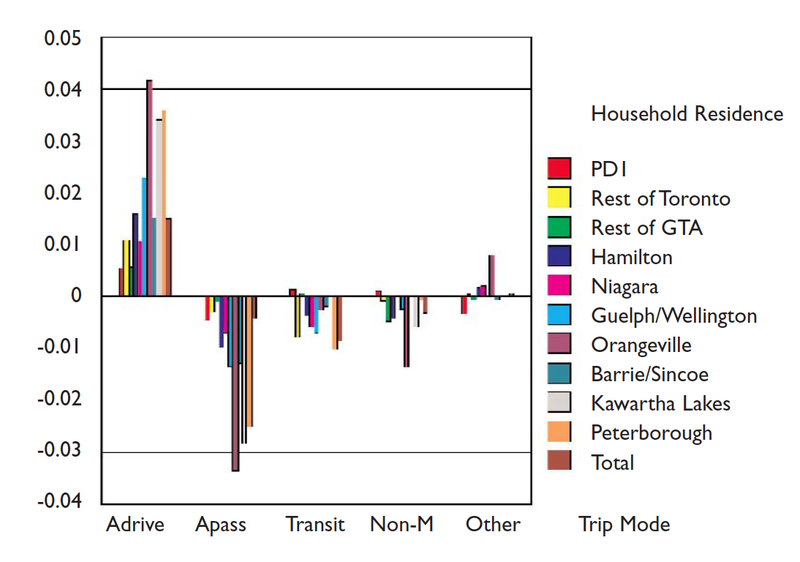 Figure 3.9 shows that total daily trips and daily auto-drive trips by Central Ontario Zone residents have increased faster than the population between 1996 and 2001. The greatest gaps between population and trip growth rates have generally occurred outside the GTA+H. Further, the growth rate for auto-drive trips exceeds the total trip growth rate everywhere except in Planning District 1. These figures support the assertion that current planning practice in the Central Ontario Zone has not been transit-supportive, despite policy statements to the contrary. Auto-passenger trips (including those made by ridesharing or carpooling) and non-motorized trips (walking or cycling) have lost modal share to the auto-drive mode over the past five years. Many factors underlie this trend, including demographic and socioeconomic trends16 and shortfalls in operating and capital support for alternatives to automobile travel. 9. The 2001 TTS data were released in "preliminary" form on October 31, 2002. Thus very little time has been available to analyse the 2001 data. What is presented in this paper represents a first cut at this analysis. Also, some statistics may change slightly once a final version of the database is eventually released. 10. Before 1996 the TTS survey area did not extend beyond the GTA+H. The 1964 data are obtained from the 1964 MTARTS study (see Miller and Shalaby, 2000). 11. In this and subsequent exhibits, the trip purpose definitions are as follows: HBx: a home-based trip for purpose x, where a home-based trip is one which either begins or ends at home; x =W other end of the trip is work; x = S: other end of the trip is school; x= D: other end of the trip is a discretionary activity other than work or school; NHB: a trip that does not have home as either one of its ends. 12. A daily trip rate of only 2 to 2.5 trips per person may sound low. Note, however, that this rate is averaged over all persons, including children under 11 years of age for whom trip information is not collected. Also TTS does experience some under-reporting of non-home-based trips that people simply forget to report in the survey. 13. The 1991-1996 period actually saw a slight decline in average GTA+H household auto ownership levels (Figure II.2, Appendix II), undoubtedly due to the serious recession of the early 1990's. Analysis undertaken by Roorda, et al. (2000) indicates that household vehicle replacements/additions slowed down significantly during the 1990-1995 period. 14. See Miller and Shalaby (2000) for a more detailed discussion both of non-work, non-peak travel and of the evolution of female travel behaviour. 15. This is not to say that these agencies were ever inefficient. Under the pre-1998 operating subsidy policies, the TTC recovered 67% of its operating costs, which was the highest level of any North American transit agency. Both the TTC and GO Transit now recover more than 80% of their operating costs through the fare box. 16. These have not been explored in detail in this paper, but are discussed in other studies, such as Miller and Shalaby (2000). Briefly, the aging of the baby boom generation and rising affluence in the COZ both tend to encourage automobile use and decrease transit use. Increasing labour force participation and "motorization" (i.e., possession of a driver's licence and access to a vehicle) among women also play a significant role in these trends.